Despite rapid strides in the medical and technological fields during the last four decades including the development of nucleic acid and protein-based biomarkers, the mortality still remains a burning problem because of the delayed diagnosis of many diseases. This is particularly ascribed to the lower specificity and sensitivity of the methods used for diagnosis. The compelling situation has shifted the focus of expression biology toward identification and development of sensitive and specific markers for diagnosis and prognosis of different diseases by using microRNAs (miRNAs). miRNAs are short noncoding RNAs of 18–25 nucleotides. In mammals and multicellular organisms, they play significant role in nearly all biological pathways. Next-generation sequencing techniques have played role in discovery of noncoding RNA molecules. As compared to total protein coding sequences, large numbers of noncoding RNAs exist which are key to many new discoveries related to biological phenomena and pathologies. Noncoding RNA family in humans consists of about 1400 miRNAs. Their functional significance has been shown in developmental and pathological processes. miRNAs can be easily detected in tissue samples and body fluid of the patients. Hence, miRNAs could act as potential biomarker candidates. miRNA molecules have already made their way to clinical medicine as biomarkers for diagnosis and prognosis of diseases as well as therapeutic targets for treatment. Redox imbalance leads to oxidative stress which is associated with various diseases. Accumulated evidence suggests that oxidative stress stimulates production of several miRNAs which area known as oxidative stress-responsive miRNAs. They further play a role in connecting the dysregulated antioxidant defense system with imbalanced redox state. 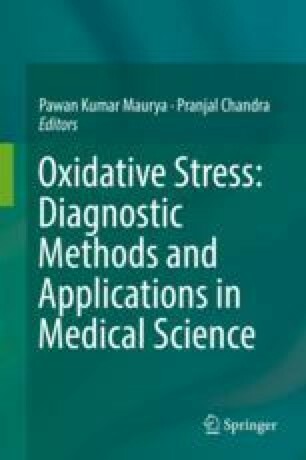 The present chapter summarizes recent findings on diagnostic and prognostic ability of oxidative stress-responsive miRNAs. In addition, the role of miRNAs in cancer has also been discussed. Studies on functional and regulatory aspects of oxidative stress-associated miRNAs will provide new direction to discovery of novel diagnostic and prognostic biomarkers. SK acknowledges Central University of Punjab, Bathinda, for providing necessary infrastructure facility and financial support in the form of Research Seed Money Grant GP:25. AKP also acknowledges SAP and DST-FIST facilities of the Biochemistry Department of the University of Allahabad, Allahabad, India.